Due to his acts of pity, Francis is presented in the media as a man channeling the sui generis quality of religion that is independent of politics and cultural difference. This is the danger of pity. It seems like we need a reminder from Nietzsche: pity is never innocent. Pity is not free from ideology, politics, history, or the literary; rather, it is situated, contextual, and often masks hidden agendas. In his relentless critique of Christianity, Nietzsche never ceases to remind us of this, and to implore us to be skeptical of “the innocent rhetoric from the domain of the religio-moral idiosyncrasy….” (The Anti-Christ 190, 130) For it is precisely in the sublime presentation of action and kind words that the greatest ideological threats can lie dormant. This is not to suggest that pity is a “bad” thing, but simply that the quietism that pity evokes, particularly in the media, is dangerously problematic. What is so worrying about this warmhearted embrace of the new Pope by the media is that not 12 months ago the Papacy was awash in controversy and scandal. Twelve months ago, if the Pope was in the headlines it wasn’t for washing the feet of a Muslim woman or an impromptu phone call to his dentist, but due to clerical paedophilia, leaked Vatican documents, widespread nepotism and corruption, or controversial claims about the Vatican’s tax affairs. All that now seems to be forgotten and the Pope’s pity has seemingly rendered these affairs inconsequential, or at the very least made them seem to be a thing of the past. This begs the question, have we entered into a post-ideological papal age? I think not. Why are only Catholics critical of the Pope at this point? Because priests and cardinals are intimately aware of the many theological issues at stake in the recent statements made by Francis regarding gay marriage, contraception, and the salvation of atheists. Catholics are aware of something that the media has so far ignored: acts of Catholic pity reinforce, not detract, from the deeply conservative agenda of the Vatican, and no matter how liberal the new Pope’s actions might seem, he is the ruler of the oldest sacerdotal-monarchical state in the world. Indeed, it is for this reason that we should be skeptical of the distinction noted above by Vito Mancuso between the Pope and the conservative base of the Vatican, for the face of reform is never as innocent as it seems. As Nietzsche reminds us again and again, pity is a conservative Christian virtue. The danger of assuming that pity is non-ideological, is that it makes it impossible to critique the various political interests that pious acts support. The media coverage of the Vatican over the last year seems to suggest an absolute moral standard that is independent of context. The lesson learned here seems simple: if a story of Vatican corruption or clerical abuse is leaked the media critiques the papacy, and if an act of pity woos believers in St. Peter’s Square it praises the papacy. What this superficial analysis misses is that pity is never innocent, and that not criticizing the Pope on account of his pious acts is to assume a sui generis space of religious action that is free of political, historical, and literary influence. As Nietszche argues, our entire literary and artistic décadence, “from St. Petersburg to Paris, from Tolstoy to Wagner,” has privileged pity in a way that is at times dangerously blind to the wider abuses that sublime acts function to mask. As critics, it is our job to “be inexorable here, to wield the knife here.” (130) Pity is not a privileged site—it is situated and contextual—and when we see others cutting out a privileged space for it, we need to expose this sacralization. This entry was posted in Politics and Religion, Religion and Society, Religion and Theory, Religion in the News, Tenzan Eaghll, Theory and Method, Theory in the Real World, Uncategorized and tagged atheists, Bergoglio, Catholics, Christianity, contraception, Gay Marriage, Ideology, La Repubblica, Nietzsche, paedophilia, pity, politics, Pope Francis, sacralization, sui generis, Vatican, Vito Mancuso. Bookmark the permalink. What is your evidendence that the Pope is motivated, theologically or personally, by pity? Seems like a straw man designed to help you avoid evaluating the Pope’s actions as “compassion” or “loving-kindness.” It’s also a logical leap to say that covering this Pope positively for positive things makes scandals under other Popes forgotten. Very poorly argued. First off, you don’t need evidence to demonstrate that action is not pure and is motivated by a whole set of causes, that is a given. My problem is that this has so far been ignored. The Pope’s “compassion” and “loving kindness” reflect the institution he leads, not an a priori purity. Secondly, the various issues that gave rise to the scandals haven’t gone away, there are just being ignored. It is only a matter of time before claims of corruption and clerical abuses resurface. Could it possibly be that the author really meant piety? Tenzan, I don’t quite get this piece. I feel like you’re resting on two implicit ideas that I disagree with: one, that institutions have a static essence rather than being constituted and reconstituted by the bodies that make up those institutions (hence you keep talking about the Vatican and the Catholic church as institutions that have their own essence of which the pope is only a cosmetic figurehead, whereas I see a much more complex, mutually constitutive dynamic between the two), and two, that what you call pity and what I call the practice of compassion is nonpolitical, whereas I think that bodily practices and the affects that go along with them are the substance of politics. What do you think? Thanks for reading it. I totally agree that the Vatican is not a static body, but it is never free of the historical, political, and literary elements that always “reconstitute” it. Secondly, I disagree that the pity or compassion is non-political. Now, to be clear, I do not think that ‘everything is political’ (as I have argued once in a previous post), but I do think that no action escapes the web of finite context and therefore always belies certain interests. Acts of pity are not a priori political, but they cross paths with the political, as well as the literary, the artistic, etc, just like all other action. Sorry, let me clarify. I also agree that compassion is political. That’s precisely why the new Pope is having the impact that he’s having: because he’s rewriting the politics of the Vatican along the lines of a new politics of compassion. 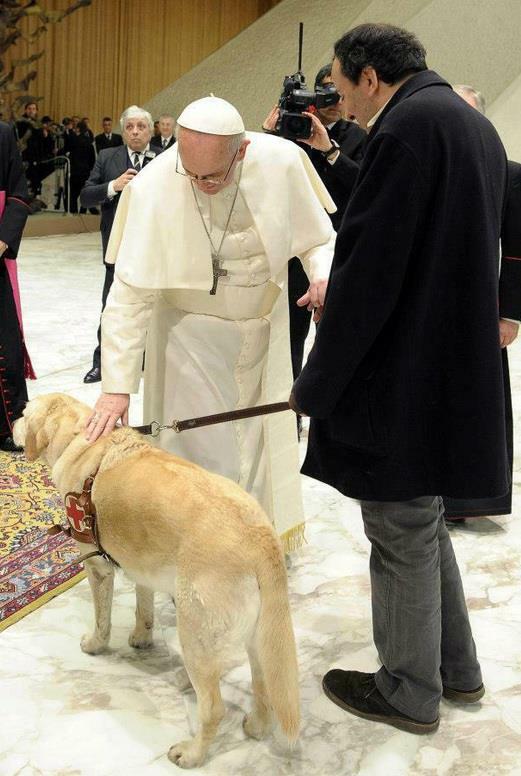 I’m not persuaded that Francis is participating in some grand deception. He’s not a puppet for “the Vatican,” if for no other reason than that the relationship between the intransigent institutional forces of the Vatican (which are themselves made up of a community of bodies) and the web of power relations surrounding the Pope is much more complicated than that. The Pope is changing the affects, practices, and discourses of Catholicism, and pulling the institutional forces of the Vatican behind him. That process needs to be assessed with much more precision. I don’t know. Maybe I just feel like this thing about “pity” in Nietzsche is not his best work–it’s him at his most sour and least useful. Although I also agree that he is not a puppet for the Vatican, I do not think that he is in opposition to it either. His position, at the very least (as you suggest), needs to be analyzed far more critically than current news articles have done. His acts of pity have effectively silenced all critical articles on the papacy, which were quite prevalent a year ago. (This shift if comparable to the media praise that welcomed Obama after the Bush presidency). Regarding Nietzsche, I would say I am using him lightly here, no different than Foucault used him to critique the genealogical sediments of Christian practice in History of Sexuality or the Care of the Self. I purposelessly left out Nietzsche’s emphasis on ‘evolution’, which accompanies his comments on pity in the Anti-Christ, for this reason. I think that thing about Obama/Bush is the essence of where we disagree. You see an abstract institution (the Papacy/the Vatican; the Presidency/the US Government) as the locus of power. I see the bodies that compose the institution as the locus of power. If you want to talk about how the media ecology (one headline a day, the newest topic before the oldest) generates a certain kind of noise around Francis, that totally makes sense to me and I couldn’t agree more that there’s room for critique there. I see the papacy neither as an abstract institution nor a series of bodies that compose it, but a series of literary, political, and historical influences (traces, if your will) that give rise to possible trends, shifts, etc. Hence, I don’t deny change is happening, what I deny is that it is as pure as it is presented in the media, and as the various quotes suggest. The quotes aren’t simply showing a shift, they are reiterating the very ideology in question. To state that St. Francis is embodying the true essence of Christ-like behavior shows hold old assumptions and reifications are being re-employed to sacrilize political and theological motives. Nietzsche never simply reduced to things to a play of forces (contra essentialism), but showed how those forces were being put to work to support various motives and assumptions. Instrumentalist, no. Neo-Marxist, yes. As Derrida argued, deconstruction has always been intertwined with a certain Marxist spector. Perhaps I should have titled it ‘A Plea to Theorize the Pope’s Pity,’ because that is what I meant. I do not assume some general breed of rational actors who operate in a particular way inside the Vatican, but simply want more critical analysis of the motives and interests at work. Yeah, I like that. And for me, that theorization leads onto the possibility that for Francis developing new practices of compassion itself is a motive or an “interest,” in your terms. The Catholic church, my dear friend, is also part of the 1%. That being said, the point of my post was not to be ‘anti-Catholic’ but simply to stress the need for more critical analysis of the various forces represented at the Vatican. If there is an Anti-Catholic tone in my piece, it is simply because I was trying to counter the medias glowing coverage over the past 6 months. Additionally, let me to stress that I did not mean to imply that the job of scholars is to be a moral corrective to the failings of either the Papacy or the media, but simply that both require a critical eye, because there is much more going on at the Vatican (historically and politically) than what has been represented in the news so far.